The vacation amenities at Beach N Fun are indoors and outdoors. 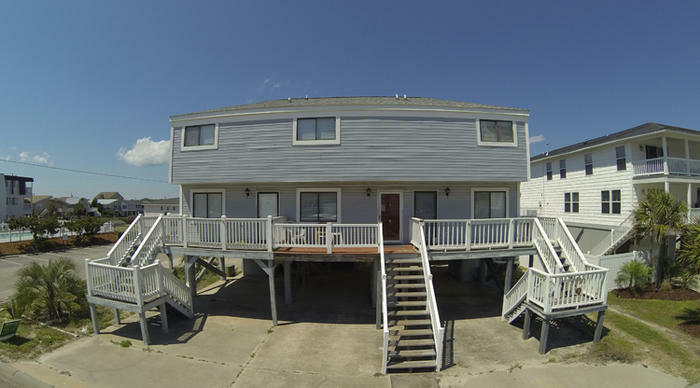 This North Myrtle Beach resort only has nine units so it is an intimate setting right across the street from the beach. Beach N Fun spans a whole block and is nestled between Lake Drive and Ocean Boulevard at 51st Avenue North. This traditional North Myrtle Beach resort has North Myrtle Beach condominiums that are tastefully decorated and comfortably accommodating. The two-bedroom condos in North Myrtle Beach at Beach N Fun are spacious enough for up to six people. The living room has a sleeper sofa and the kitchen has full-size appliances. These North Myrtle Beach rentals feature wonderfully equipped kitchens. It is just like at your home with a refrigerator, stove, oven and dishwasher. To have these conveniences at your fingertips during your North Myrtle Beach vacation is a real life saver because you do not have to live out of a cooler and eat only cold cuts. Make yourself at home in these North Myrtle Beach condo rentals and use all of the amenities that are featured in these vacation units. Your family has access to a private washing machine and clothes dryer in your North Myrtle Beach rental. There are televisions and DVD players in these non-smoking North Myrtle Beach rentals as well. One of the best features of these condos in North Myrtle Beach, SC is the open air balcony. Furnished so you can fully relax, these balconies are a wonderful respite during your otherwise jam-packed North Myrtle Beach vacation. Plan your North Myrtle Beach vacation day while watching the sun come up from your balcony. Leave the comfort of your North Myrtle Beach vacation rental for the comfort of the beachfront. All you need is a bathing suit to enjoy the white sandy beaches. Jump into the warm ocean water and splash and play with the kids. Snorkel in the shallow water and wade on the sandbar. Take long walks at all hours of the day and marvel at the views. Whether it is first thing in the morning or as the moon rises high in the sky, a walk on the beach is calming and meditative. Just down the beach from this North Myrtle Beach resort is the Cherry Grove Fishing Pier. The Ocean Drive section of North Myrtle Beach, SC is where there are beach clubs. Live beach music fills the air and entices dancers to take to the dance floor and learn how to shag. Barefoot Landing is down the street from Beach N Fun and this is the place to go for food, entertainment and plenty of shopping. You will love and appreciate the location of Beach N Fun in North Myrtle Beach, South Carolina because everything is accessible. North Myrtle Beach amusements and attractions are in close proximity to Beach N Fun. There is a wide variety of miniature golf courses from which you can choose. All ages love to play these crazy courses that are as suited for kids as they are for adults. Visit the Waccatee Zoo and Ripley’s Aquarium. Relax in a vineyard while sipping locally made wine. Tour the area in a Jeep, duck boat, riverboat, speed boat or helicopter. See the sights that make North Myrtle Beach, SC such a popular vacation destination for families, golfers and retirees. Hear famous ghost stories and local legends. North Myrtle Beach, SC has kayak rentals for the creeks, Sea Doo rentals for the ocean and jon boat rentals for the river. The thrill seekers in your family can go bungee jumping and shark fishing. Those seeking the peaceful and tranquil might appreciate a sunset cruise down the river or out to sea. The area features an amusement park and water parks. And sports fan might like to see a Myrtle Beach Pelicans professional baseball game or visit the Myrtle Beach Speedway for some racing. Hiking and biking trails also dot the Myrtle Beach landscape. Whatever your pleasure Myrtle Beach offers it. Enjoy the comfort and privacy of your North Myrtle Beach vacation rental at Beach N Fun and enjoy all the excitement that surrounds this North Myrtle Beach resort in the form of water sports, amusements, attractions, live entertainment theatres, shopping, golf courses and dining. This small complex of North Myrtle Beach condominium rentals is beautifully located so that regardless of what activity your family wants to pursue during your North Myrtle Beach vacation, you will always be right near it. You do not want to spend your beach vacation driving from destination to destination so make plans to stay at Beach N Fun North Myrtle Beach resort and put yourself in a location central to it all!